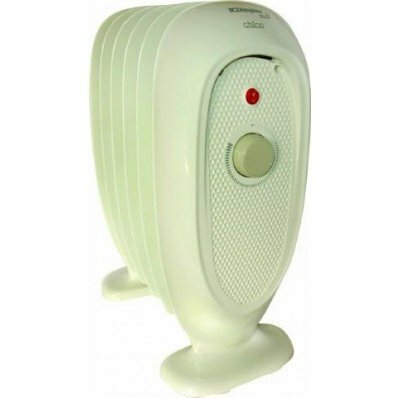 With its unique oil free heating technology the Dimplex Eco Chico 700W Oil Free baby column heater provides more heat faster than a standard oil filled baby column radiator of the same heat output*. When using a portable heater you want to feel its warmth quickly and the Eco Chico from Dimplex does just that. The absence of oil means that the OFRB7 heats up very quickly indeed. In fact manufacturer laboratory tests show that this economical oil free column heater, provides approx 30% more effective room heat than an equivalent output oil filled column radiator, based on the average room temperature after one hour*. The unique patented fin design provides enhanced heat distrubition making the Eco Chico perfect for almost any modest size room in the house, and because it has no oil there is no risk of leaking; it's light enough to move from room to room; plus it's easier to recycle/dispose of at the end of its useful life. With thermostatic control the Eco Chico offers user control over temperature and energy consumption, and it's compact design makes this nifty little heater easy to store away when not in use. The Eco Chico has been fully and independently safety tested to stringent BEAB Intertek standards and comes complete with a 3 year manufacturers warranty. *Tests carried out on 2kW output model. Oil Free heaters are a new development in Portable heating. Some are styled like traditional oil filled column heaters whilst others are more modern in design. Like their oil filled counterparts outputs vary from 700w to 3kW. The main benefit with oil free radiators is that they warm up very fast, are lighter in weight (yet durable) and responsive to providing heat when you need it in comparison to oil filled products. In terms of energy saving features, look out for thermostats, heat settings and timers. More advanced features include electronic climate control, remote controls, and twin panel elements to increase control over the appliance.